Just to let you know, we had a very nice trip. Everything was perfect, but we would especially thank Ajju. He was Excellent. Subject: Article for Web Page. Thank you, Sharad, Manjeet and Vijay for giving me two extraordinary adventures of a lifetime. The travel urge grabbed me when I was a teenager and my father, post WW11,in a grey and weary England said that we were going to Guernsey in the Channel Islands for a holiday. We had a wonderful time and my world became a big mystery to be explored and savoured. Travel became a passion both as a volunteer or a curious passenger or both. It arrived the following day. It was detailed, thorough, comprehensive , had many inclusions included in the cost and became the blue print for what was to become a 24 day adventure which included 4 National Parks, Corbett ( India’s first Park) Bharatpur Bird Sanctuary, Bandhavgarh, and Kanha plus the cities of New Delhi, Jaipur, Agra and Khajuraho. The main focus was wildlife. Several months were spent in working out the details, a good friend was persuaded to join me, visas were granted, vaccines administered, books read, deposits sent and we were ready, more or less. We were to find an enormous country of multiple contrasts , traffic jams that defy the imagination and a small group of men who were determined that we would have a great experience-Sharad, Manjeet Sharma, Nature Safari’s wonderful manager who took everything in his stride no matter the time of day or night, and Vijay, our driver who took his task seriously, drove the immaculate SUV well and reminded us that, if we needed anything he was there for us. Vijay became a valued friend. We were to see many fantastic birds, a herd of wild elephants, several species of deer and monkeys wild boar, reptiles , many other creatures and, of course..Tigers! The cities were amazing, every school youngster who saw us , surrounded us, tried out their English, took our photographs, shook our hands and gave us an unexpected and joyful experience. Gorgeous as the Taj is the human interaction was very powerful. We left India with remarkable memories which still give us a lot of pleasure and quite a few laughs. One more adventure in a long life beckoned-as did India. My beloved husband Guy no longer flies long distances so I asked niece Caroline if she would join me. Caroline lives in Ireland, works hard with her own company and could only leave it for 2 weeks. Sharad was contacted, an itinerary agreed upon with input from all of us. It was city based, beginning in New Delhi and included Jaipur, Ranthambhore for a 2 day safari, Agra, Varanasi and finishing in the hill city of Darjeeling-the last item on my bucket list! Our departure date was October 21st. then-life happened. On October 17th Guy had a heart attack in the middle of the night. He, by some wonderful miracle, received almost immediate intervention, and not only survived but is doing well. What to do about our trip? Sharad was called. He was compassionate, calm , reassuring and said that anytime we wished to reschedule we could. We did have some monetary losses but we did make the trip in late November. A welcoming Manjeet met me at 3AM and Caroline the following night at 4 AM. We were both very glad to see him as can be imagined. Sharad had already emailed to say that there was an international phone waiting so that there could be as much contact with Guy and our family and friends as possible. This was a gift beyond price and we are forever grateful. We were delighted to have Vijay as our driver, the hotels were good and well situated, breakfast was included and Ranthambhore included all meals and 4 safari drives with driver and guide. There were many other inclusions including representatives at airports and hotels, entrance fees for monuments , historical buildings,the crazy rickshaw drive in Old Delhi, Mahatma Ghandi’s home and tomb, the Toy Train in Darjeeling, car , driver and guide plus others. I was stricken with a severe upper respiratory infection in Agra. A doctor was immediately called to the hotel, who examined, administered and said “bed rest”. Caroline saw more of Agra than anticipated but took that in her stride. Darjeeling was an enormous change from the flatter and warmer climates of the North. We saw everest from the plane, visited Observatory Hill at dawn and witnessed a great sunrise, stayed at the Cedar Inn with its stunning views of mountains and sprawling Darjeeling spreading out below us-it was magical! I wrote this because I feel that this company not only gives value for money but are reliable, available, have great integrity,are instantly responsive if the unexpected happens, take pride and care in what they offer and love what they do. They all know and understand the environment of the forests and the need to nurture and encourage the use of natural resources. We would like to thank you for the incredible holiday we had in April 2012. Again, thanks for your service and we hope to be in touch in the not-too-distant future to start planning our next holiday to India! Many thanks for all you did to make our recent holiday in India such an enjoyable experience. The organisation was superb. All the guides were very helpful and informative. The drivers were competent and made us feel quite safe despite the poor roads and chaotic traffic they had to contend with from time to time. Vijay in particular, was outstanding. The two Tiger Den Resorts were wonderful. We particularly enjoyed our stay at Bandhavgarh. The staff were all very attentive, and our safari driver there, Sanjay, was very knowledgeable and keen to make sure we got as much as possible out of the experience. Thanks to him we finally got to see a tiger, a beautiful female. We've come home with so many good memories, and lots and lots of photos! So again, my thanks to you, Manjeet, Vijay, Sanjay and all the others for making our holiday so exciting and interesting. Having returned yesterday from Assam to Belgium, we can look back at a wonderful trip. It’s hard to believe things can go so smoothly in a country like India, still considered as a difficult country to get around without hardships. Yet, from the moment of our arrival until the visit of the Lotus Temple, everything worked out perfectly as the entire trip was meticulously organized. The lodges were good to outstanding and the food – in particular in The Bagh, Bharatpur and Tiger Den’s Resort, Bandhavgarh – was delicious. To be honest, after our last trip to India some 20 years ago and during which plenty of things went wrong, it took me a lot of effort to convince my wife to visit India for the 4th time – but, as said, everything was so well organized that we will definitely return to India for a 5th visit. And we will certainly not hesitate to contact Nature Safaris again! Greetings from the New World once again. It seems like yesterday that I was on game drives in Indian game parks. If only those could have gone on forever. I think you know from observing my enthusiasm that the trip far surpassed my highest hopes. Indeed, I felt as though I had seen many of the greatest natural wonders on India. Thanks for making it all possible and attending to both Mariynn's and my needs throughout our safaris. We are both certain that we could have done no better than to have booked our adventure with you. Here are my appraisals of the general trip as well as the individual game parks that we visited. Please feel free to post these on your website or otherwise use as they may promote your safari expeditions. You may post my name and use me as a reference (I have 253 photographs that can be sent via a U.S.-based film processing center [Walgreens] that will verify all of the animals I have seen... all I need to do is send an email message to a potential client of yours and they can see these photographs at their convenience). We have just returned from our 15 day safari to three Indian game parks (i.e., Corbett, Bandhavgarh, and Kanha National Parks) with Nature Safari India. As a veteran of numerous, past African safaris in 9 different countries of that continent, allow me to assert that the best of Indian wildlife is on a par with the best of Africa. Indeed, as an extreme nature enthusiast and professional biologist, I long for finding that remote part of the world where one simply escapes civilization and finds truly wild animals in pristine habitats. The first park we visited, Corbett, offers just that. There are dramatic vistas as one winds through the Himalayan foothill topography enroute to the Dikhala lodge. Thick sal tree forests transition into brush-laden valleys that are strewn with jagged boulders. All the while, one hears the cries and alarm calls of barking deer, chitta/spotted deer, peacocks, and the hum of cicadas (pre-monsoon season). And one also sees other mammals, including wild boars, samba deer, and perhaps the hog deer as well. Of course, there is always the chance that one may spot His or Her majesty, the Royal Bengal Tiger or Tigress. The anticipation that one may have this encounter is always on the mind in Corbett. The forest just looks as though it may yield a tiger sighting as the safari jeep/gypsy turns the next bend in the road. Continuing on towards the Dikhala Lodge, our driver, Sarjeet, stopped to show us a forested area where the tawny fish owl resides. I got good photographs and video here. He also showed us the gharial and mugger crocodiles residing in the Ramganga River. It was fascinating to see the highly endangered gharials lounging in the clear, flowing waters below. Corbett Park is one of the few remaining places where one can observe this primitive crocodilian, with its truncated snout and bulging- forward-directed eyes set well atop the head. The Dikhala Lodge, with its comfortable accommodations, overlooks the Ramganga, the river flowing through an immense, flat valley. This valley is itself bordered by mountainous terrain on the side opposite the lodge. Asian elephant herds emerge from the forests to enter the grassy, clear areas surrounding much of the river. There are also herds of spotted deer here as well. And, again, there is always the possibility that the Royal Bengal Tiger may appear here as well. Driver/nature guide Sarjeet got us into plenty of excellent elephant herds for the evening game drive. Lots of uniquely elephantine socializations, including that of adults surrounding and protecting young, were observed. The next day Sarjeet put in extra effort and found a tigress that was cooling itself in the Ramganga River near the Dikhala Lodge. We oberved her for two and a half hours. It was my first wild tiger and, appropriately enough, was seen here in Corbett, the most classic of Indian game parks. For a while, she actually looked up through the openings in the trees and, no doubt, saw us in the tower above. What a once-in-a-lifetime experience! The Royal Bengal Tigress in all her glory. By the way, the food at the Dikhala Lodge is served buffet style. It is wholesome Indian food, consisting of vegetarian and meat options. Though Nature Safari India described our Corbett Dikhala Lodge accommodations as being basic, I must note that the room we were given was large, contained a powerful cooling fan, had comfortable beds, electricity, and a large bathroom with toilet and shower. Our elephant ride on the second evening in Corbett was most pleasurable, with sightings of small elephant herds, ring-necked parakeets, and the black shouldered kite being special highlights. Exiting Corbett the following morning, Sarjeet took time to show us additional elephant herds that we had not observed earlier. It is amazing how very keenly aware the elephants are of human presence. The adults turn and face the jeep if approached too closely. While being very safety-conscious, Sarjeet nonetheless got us close enough for good photography and video of these majestic, social animals. After a night back in Delhi at a 5 star hotel (The Oberloi), we were off the next morning to Bndhavgarh Park and thus boarded a domestic flight for the nearest airport in Jabalpur. All of this had been pre-arranged via Nature Safari India months in advance. As was the case on all such occasions, we were cordially greeted by our driver at the airport. Everything ran with complete smoothness. Sensing that we were nature enthusiasts, the driver stopped on our way to Bandhavgarh Park so that we could photograph flying foxes residing in a tree, several white throated kingfishers, a peacock, and the Indian roller. We arrived at the Tiger's Den resort and were warmly received with both friendly hospitality and a delicious Indian meal. After a good night's rest in the air conditioned comfort of our room, we were off on our first game drive in Banhavgarh, which means "Brother Fort". This smaller Park is home to some approximately 50 tigers, including the grandson and great grandsons of the famous male tiger Charger (who both terrified and thrilled park visitors some one to two decades earlier by making surprise mock charges on jeeps and domestic elephants used for traveling about the park). No less than 10 minutes into Bandhavgarh we were into our first tigers, these being a tigress with two 10-month-old cubs. While the tigress was lying on her back, I obtained video footage of her caressing one of the cubs as the youngster casually ambled by her immense body. But when a wild pig started to walk near the tigers, the mother turned from tenderness to the passions of a born-hunter, her ears and eyes acutely alert as she made rapid, silent strides towards the pig. Luckily for the herbivore, it noticed one of the cubs and beat a life-saving retreat before the tigress could charge it. While our driver, Sanjay, took us about Bandhavgarh throughout the remainder of the morning so that we could get good photographs of male peacocks displaying to peahens (it was mating season during our late May/early June visit), nice shots of the common kingfisher, and some photographs of jackals and barking deer, it was on the evening drive that his skills as a Bandhavgarh guide especially came to the fore. Indeed, Sanjay placed us (along with numerous other jeeps) in just the right location so that we could observe Kahlua, a great grandson of Charger. Kahlua emerged from a mountain valley and lumbered in his uniquely feline, confident swagger along the dry grass and forest paralleling the road. 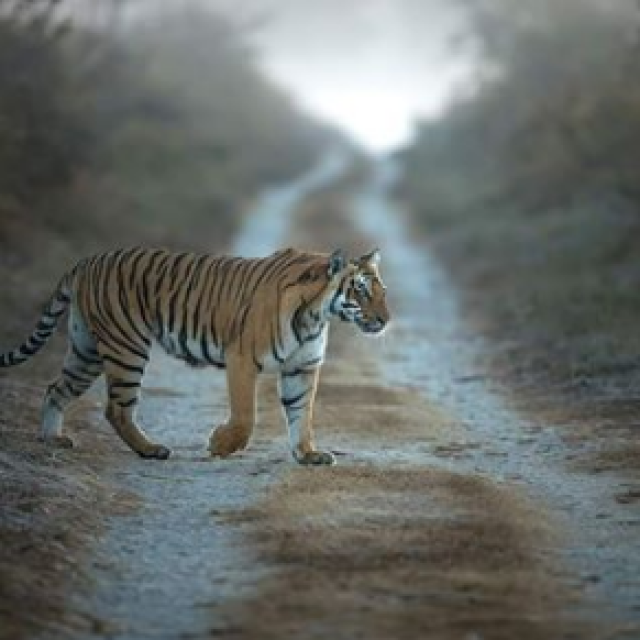 All the while Sanjay kept me about 20 to feet in front of Kahlua, his orange- and black-striped, muscled beauty flowing along to the rhythm of this tiger's evening stroll. This made for once-in-a-lifetime photo and video opportunities and I took full advantage for at least 5 minutes, Sanjay always maintaining the jeep just ahead of the this Royal Bengal Tiger. After celebrating our evening of tiger successes and getting another good night's sleep at the Tiger's Den, we were off with Sanjay for even more tigers the next morning. We saw the same tigress and two cubs again. But we also saw another great grandson of Charger. This was Nilau (spelling? ), the father of the two nearby cubs. We watched and photographed him as he glided along the grass so that he could quench his thirst from the clear-flowing, stream in the area's vicinity. How amazing it is to see these predators still living wild in a world that has otherwise gone completely digital! Always giving us much more than we had dared hope for, Sanjay also found Charger's grandson, B2 (B2 was the progeny of a cross between Charger's daughter Mohini and the male tiger called the "Mahaman male"; this male is famous for having wrested mating rights of a portion of Badhavgarh Park from Charger in 1996). This B2 tiger, who I was informed is the father of Kahlua and Nilau (the two large males seen the previous day), emerged from a rocky grotto one morning and made his way up and over the mountain. I obtained excellent video footage of this fabled tiger. Other animals seen during our visit at Bandhavgarh included sloth bears (made for great photo and video shoots), serpent eagle, changeable hawk eagle, malabar pied hornbill, chittal/spotted deer, sambar deer, ruddy mongoose, three-striped squirrel, mating Egyptian (or scavenger) vultures, jungle fowl, jackals, and bats (seen in the ancient, human-carved sandstone caves). A visit to Bandhavgarh is greatly enriched by having one's guide take them to the water pool that occurs alongside an 80 foot-long statue of a reclined Vishnu, all carved out from a single piece of sandstone. This is located half-way up the mountainside that leads to the 1,000 year old palace/fort atop the plateau. Water from a spring flows into this sacred area and fills the pool. Black-faced monkeys in the overhanging trees are very active and yet, despite their energetic activities as they swing through the overlying branches, somehow add to the serene ambience. Though we did not see any that day, it is reported that tigers, and sometimes even leopards, visit the pool to get a drink from the cool, clear waters. That must be a fantastic scene to witness! 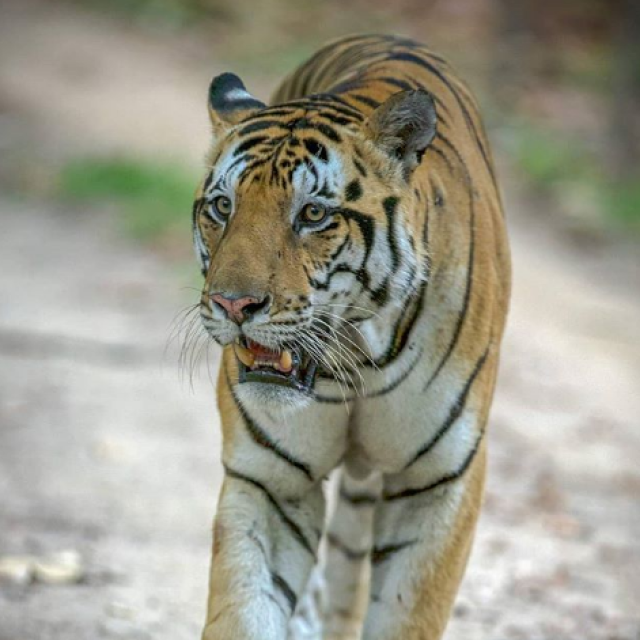 Upon leaving Bandhavgarh after 7 very fulfilling game drives, we were driven to Kanha Park, home to some 90 tigers. This park is about as large as Corbett. Besides tigers, it also contains the last population of swamp deer. It is also home to the gaur, incorrectly called the Indian bison. These latter animals are remendous, bovine beasts that may reach in excess of one ton in weight. As was the case in Corbett and and Bandhavgarh, I felt as though Sharad Vats had set us up with the best guides one could hope to find. My Kanha guide, also called Sanjay (this was also the name of our Bandhavgarh guide), knew very well how to track tigers, leopards, and all animals of the sal forest. Besides getting us into four tremendous tiger sightings during our stay, Sanjay of Kanha also found four leopards one evening. One of these was solitary and had just exited a tree when we saw it. The other was a mother, father, and a cub. How Sanjay spotted those leopards in the darkening, evening forest I will never know. But we watched this family proceed through the forest, the parents keeping a watchful eye on 'Junior' all the while. We also saw the Indian rock python and had a great tiger show from atop an elephant while in Kanha. In addition, Sanjay got us good sightings of the jungle owlet and a scops owl species. The photo opportunity with the ruddy mongoose was greatly appreciated as well. 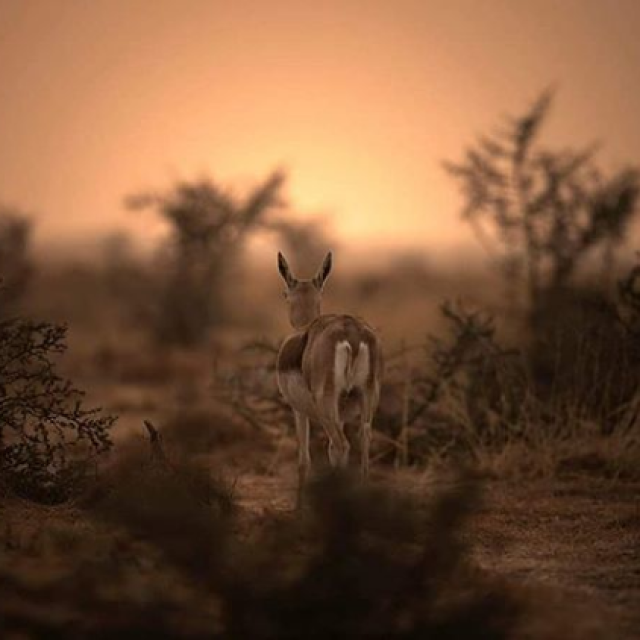 Certainly, the wildlife to be seen here is nothing short of incredible. I must mention that the Chitvan Jungle Lodge, where Sharad Vats entertains his guests who are visiting Kanha, is easily a five star accommodation. The rooms one stays in include a giant living room equipped with comfortable, solidly built furniture, large air-conditioned bedroom (with refrigerator), and a very large indoor bathroom as well as an optional outdoor shower. There is a large swimming pool of a uniformly 3.5 foot depth for those wishing to cool off a bit and take in some exercise as well. Morning tea and bisquits/cookies are delivered early to one's room (it arrives a half hour before the game drive). Meals are served to one's tastes by a chef who always visits you to see if you are satisfied with your meal. The presentation of the meals is excellent, with dinner being served at tables set out on the grass and thus under the stars. The reception room is large and spacious. It has a good library that is stocked with local wildlife books as well as inspired writings by such authors as Gandhi, Lincoln, and various other authors presenting on theological topics. I would recommend, without any reservations at all, Sharad Vats and his www.naturesafariindia.com services to anyone who wishes to experience the wildlife of India. I cannot imagine a more organized and congenial service anywhere that simply delivers on the wildlife one has come to see. The fact that the accommodations are superb just makes my recommendation all the stronger. Stay in touch for next year. I shall begin inquiring about bringing a group of students to the game parks of India for next year. Naturally, we would need your services to properly arrange this. "We have spent 16 days primarily visiting National Parks and Sharad and his team ensured the extensive logostics worked perfectly. There were someone to meet and greet at every juncture. Knowledgeable guides and helpfull staff were everywhere. We were thouroughly briefed at the start and everything went smoothly throughout the entire trip. We visited Corbett, Bandavgahr and Kahna and saw lots of wildlife, not least 9 Tigers which was the main goal of the trip. So all in all a great success." Hope this is the sort of thing....please note my new mail adress - new job!! I was really impressed by the punctuality and all the services of your company and by the friendliness and the professionality of your collaborators. My first trip to India has definitely been well organized and I spent nice and interesting days. I got to see the tigers and I had the chance to take some good pictures of birds, places and other animals. In Bandhavgarh, surprisingly, I didn't have many chances to spot tigers (just one good spotting from the jeep), probably due to the fact that my stay was shorter there than in Khana. The Tiger Den Resort was very comfortable with a very cordial and familiar atmosphere just as Tuli Tiger Resort was, which also offers very well prepared guides for safari. In fact I did eight spottings of tigers, six of which from the jeep and one very near, about 5 meters, for 25 minutes. Certainly I will contact you in the future to organize some other vacations maybe in Gir and Kaziranga. Until then, thanks for everything! Hi! Sorry about the delay in answering your email. My company was moving to a new building this weekend. We really enjoyed the travel arrangements made by Sharad. He's very easy to work with, very honest and trustworthy, and made an excellent itinerary for us, along with some great hotel reservations, and used expert nature guides. We highly recommend him. We are very lucky that someone suggested him to us, and our trip arrangements were handled expertly and professionally by him and his assistant. However, we did not go to see tigers (we went at the wrong season of the year); our main focus was bird watching, and that was superb. I can honestly say that you won't go wrong if you use Sharad for your travel arrangements. We definitely will use him again in the future. We are now back in the UK and would like to send our sincere thanks to you and your team for helping us have a marvellous holiday. We were very impressed by the thoroughness of our intinerary, the attention to detail was excellent - nothing was left to chance. Not only were we were looked after every step of the way, last minute changes we requested during our trip were accommodated with speed and efficiency - your service couldn't be bettered. We also appreciated the way that you kept in contact with us during our time in India - a nice personal touch which made us feel more like welcome visitors and not just clients. 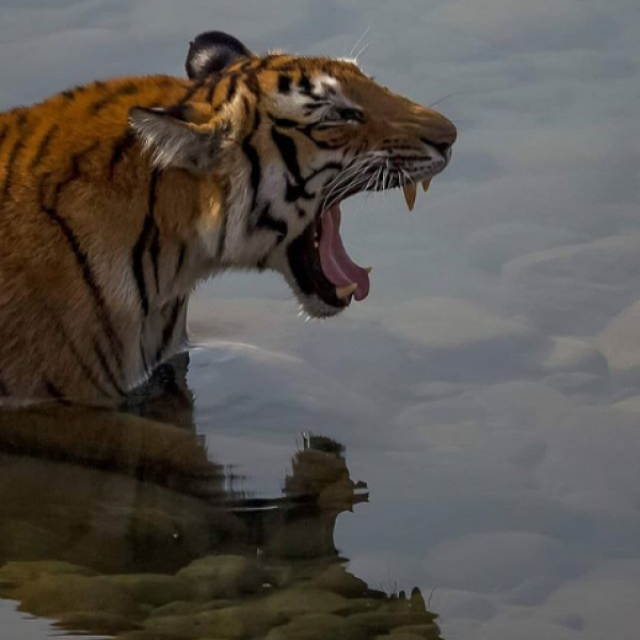 Our tiger sightings were fantastic (Bandhavgarh thoroughly recommended) and we feel privileged to have seen these wonderful creatures in their natural habitat. We read your tribute to Challenger - he was truly a magnificent animal and were glad we had the opportunity to see him but sorry that it was in such sad circumstances. We have tried to send this email with photos of Challenger attached but it has been returned by your mailbox as 'over quota'. We have also tried to send some more photos which you may like to use on your site and although we've not had them returned, we are not sure if you have received them or not, perhaps you can let us know. We will be happy to send photos again if you would like them. Thank you again for all your help and also for the wildlife book, it's a wonderful souvenier of our visit. We wanted our India trip to emphasize wildlife and nature (and of course we hoped to see tigers! ), but we wanted also to get a feeling for the diverse spiritual and cultural history of India and her people. With the limited time we had available for travel these goals seemed almost too much to ask. But as it turned out, from start to finish our India trip was a resounding success, thanks mostly to the superb planning and professional care provided for us by Sharad Vats and Nature Safari Ltd. At each camp, national park, and historic site, we felt like we were treated as VIP's. Transfers were generally seamless, and Sharad Vats arranged and kept viable backup plans in place in case we experienced flight delays or cancellations due to weather. We were always met on time by a friendly and knowledgeable guide upon our arrival into a new train station or airport, and the personal sightseeing tours arranged for us in cities and historic areas were outstanding and truly informative. Our hotel and camp accommodations (most of which were suggested or recommended by Nature Safari) were always of very high quality and comfort, as was the food and service. Our car transportation arrangements were uniformly excellent and our driving days were quite comfortable, despite the inherent difficulties of road travel in some of the remote regions we visited. To top it all off, we were fortunate beyond our hopes in sighting tigers and other wildlife in the parks, due especially to the superb skills of the naturalists and trackers arranged for our visit by Nature Safari. We arrived home with photographs and memories to last a lifetime! I recommend most highly the expert services of Sharad Vats and Nature Safari Ltd. to all serious travelers who seek the best experiences that a cultural and wildlife-oriented visit to India can offer. I must say that the whole experience from the booking (which can be a little daunting over the internet) to the actual tour was fantastic and handled in a very professional and thorough way - The 'Temples and Tiger Tour' which I basically followed was superb, each place being incredibly interesting with the reassurance that all reservations and more importantly transfers to the various airports, train stations and hotels are taken care of, which were absolutely faultless - Thank you! I have also passed on your business card and my commendation to the TCI representative here at Uhde India Limited Mumbai. I hope he will be able to refer more clients to Nature Safari. Best of luck in the future and thank you for a wonderful holiday. Tiger, tiger, tiger, we met a tiger! Unbelievably beautiful tiger is in front of us, 5m ahead of us. He watched me, and I watched him. I visited several national parks in India, of course including Ranthamnbore. But I had the best experience in Bandhavgarh National Park. Much more chances to see tigers, good trail to the Fort learning Hindu gods and history, and a nice friendly lodge, Tiger Den Resort. We all enjoyed staying Tiger Den Resort. With beautiful gardens, spacious rooms with hot water and especially the foods were excellent. Shailendra and all the staff at the Resort were so kind and helpful. We saw tigers every day. Sharad, thank you very much for all your efforts and services. You are the most reliable operator in India. I organized the tour to India so many times, and I feel getting tired of it. But I would like to come back here again next year. It is worth spending so much time and money. It is worth traveling a long way by train to Bandhavgarh. We had a slide show after dinner at the Forest Lodge by the naturalist, Ansar Khan.